As a dietary supplement, take 6 capsules daily with food. For those who are sensitive, split dosage (3 capsules in the morning, and 3 capsules in the evening). Vigorous exercise and a sensible diet are recommended. This product is intended for adults 18 years or older who are seriously weight training. Do not take this product if you have any of the following: high or low blood pressure, heart disease, high cholesterol, arrhythmias, osteoporosis, diabetes, prostate enlargement. Do not take this product if you are taking a monoamine oxidase B inhibitor (MAO-B). Also avoid using this product if you have or have had liver, kidney, thyroid disease, or a stroke. Do not take this product if you have had prostate, testicular, or breast cancer. Discontinue use 2 weeks prior to surgery. If you experience any adverse reaction to this product, discontinue use immediately and contact your healthcare professional. Do not exceed the recommended daily serving. Do not use if safety seal is broken. Do not take of pregnant or nursing. Maximum Testosterone Support Matrix!Maximum Testosterone Support Matrix! Testavar-HD, the ultimate all-in-one free testosterone performance booster, supports extreme muscle mass, strength, stamina, libido, energy and vitality. 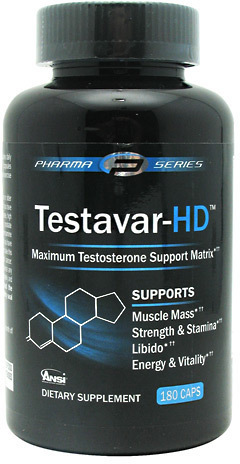 Testavar-HD will deliver insane results in conjuction with a sensible diet and workout routine. Testavar-HD can be stacked with BetaLean-SCA for enhanced lean muscle mass and vascularity. Maximum Testosterone Support Matrix. Supports: Muscle Mass, Strength & Stamina, Libido, Energy & Vitality.